The uneasy alliance between the United States and Soviet Russia during WWII quickly unraveled in the post-war era. Even during the war, problems had surfaced. Joseph Stalin believed that the opening up a second front in Europe was intentionally delayed by the Allies so that Russia might continue to bear the brunt of the German war. Following the death of President Roosevelt in April and the surrender of Germany in May 1945, President Truman met with the Allied leaders in Potsdam, Germany. 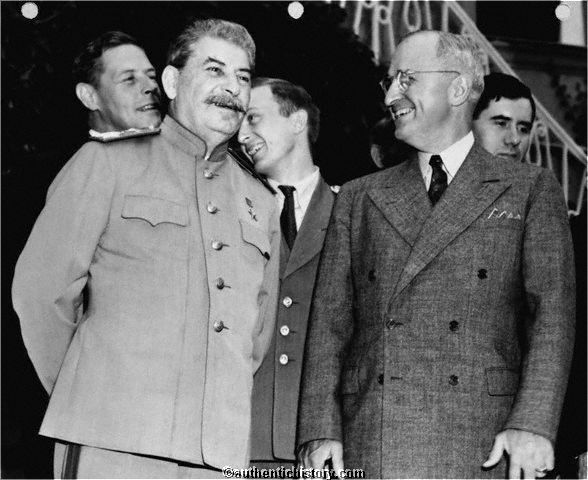 Truman and British Prime Minister Winston Churchill quickly became suspicious of Stalin's intentions. When Churchill proposed an early withdrawal of Russian forces from Iran, Stalin objected. For his part, Truman was reluctant to say much about America's new weapon, the atomic bomb, and he left Potsdam rather quickly so as not to have to explain to Stalin why he had not kept his ally informed (he subsequently shared atomic information with England and Canada, but not with Russia). Although the role of developing Cold War politics in the decision to use the atomic bomb to end the war with Japan is debatable, it seems clear that the political implications of the bomb in America's dealings with Russia were at least considered. Whatever the considerations, use of the atomic bomb failed to make Russian more malleable, and instead drove Stalin to get the bomb as quickly as possible. October 24, 1945: The UN: The United Nations Charter went into effect. January 30, 1946: Iran: As it was becoming increasingly clear that the Soviet Union was going to miss its agreed upon deadline for withdrawing their forces from jointly occupied Iran (The British and American forces withdrew within the deadline, per the agreement), the United Nations passed Resolution 2, urging Iran and the Soviet Union to reach a speedy agreement. February 9, 1946: Joseph Stalin, at a meeting of Voters of the Stalin Electoral District, Moscow, declared that communism & capitalism were incompatible. served at the U.S. embassy in Moscow for several years, and his opinions about Soviet mentality became the basis for American foreign policy toward the USSR. 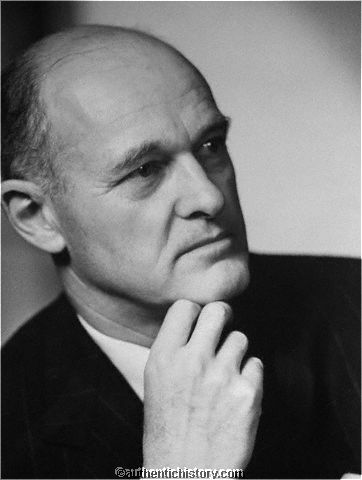 Among Kennan's assertions were that the Soviet Union was motivated by both traditional Russian imperialism and by Marxist ideology; Soviet behavior was inherently expansionist and paranoid, posing a threat to the United States and its allies. On September 24, 1946, President Truman received a report that had been based on Kennan's observations, with further contributions from Kennan. 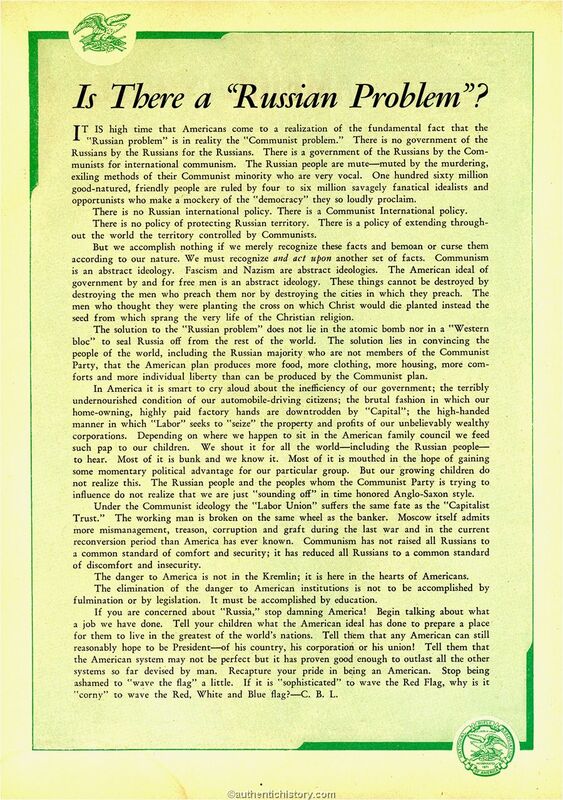 In July 1947 Kennan, writing as "Mr. X", published "The Sources of Soviet Conduct" in Foreign Affairs magazine. Kennan created a foreign policy toward the Soviet Union when he wrote: ?? ?United States policy toward the Soviet Union must be that of a long-term, patient but firm and vigilant containment of Russian expansive tendencies.??? March 2, 1946: Iran: The Soviets failed to meet the agreed upon deadline to withdraw their forces from Iran. March 5, 1946: The Iron Curtain: Former British Prime Minister Winston Churchill, then serving as the leader of the opposition following his party's defeat in the 1945 election, came to the United States in March. while at Westminster College in Fulton, Missouri, Churchill gave a speech titled, "The Sinews of Peace." In describing Soviet behavior in the months following the end of WWII, he declared that an "iron curtain" had descended across Europe, and he then called for an Anglo-American alliance against the Soviets. March 10, 1946: Iran: Truman demanded that the Soviets withdraw from Iran. March 24, 1946: Iran: The Soviet Union pledged to withdraw their troops from Iran, but remained for several more weeks. Two more United Nations Security Council resolutions placed additional pressure on the Soviets, until they finally withdrew. March 1946: Greece: The Greek Communist Party (KKE), funded by neighboring Yugoslavia, fought against the internationally recognized Greek government that was formulated out of the March 31 elections which the KKE had boycotted. Although the British had been active early in the Greek Civil War in helping the pro-democratic forces, a dwindling treasury forced them in late 1946 to request that the United States step in. May 9, 1946: Albert Einstein spoke via radio to students at Northwestern University about the necessity of world government. June 14, 1946: The Baruch Plan: Bernard Baruch, U.S. Representative to the United Nations Atomic Energy Commission, delivered the Baruch Plan to the first session of the UNAEC, which proposed international control of atomic energy. 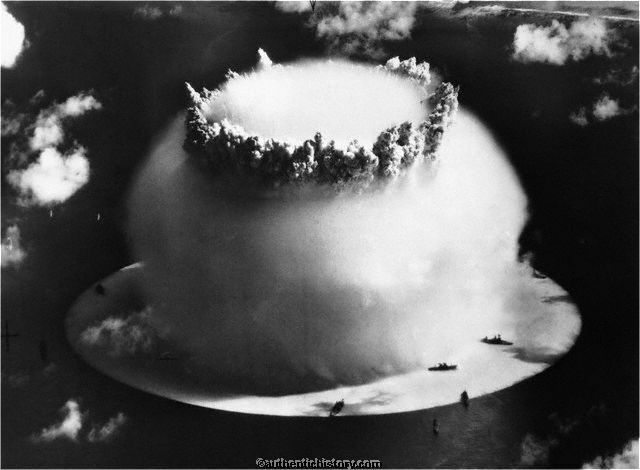 July 1, 1946: Bikini Atoll: The "Able" test of "Operation Crossroads" was conducted. 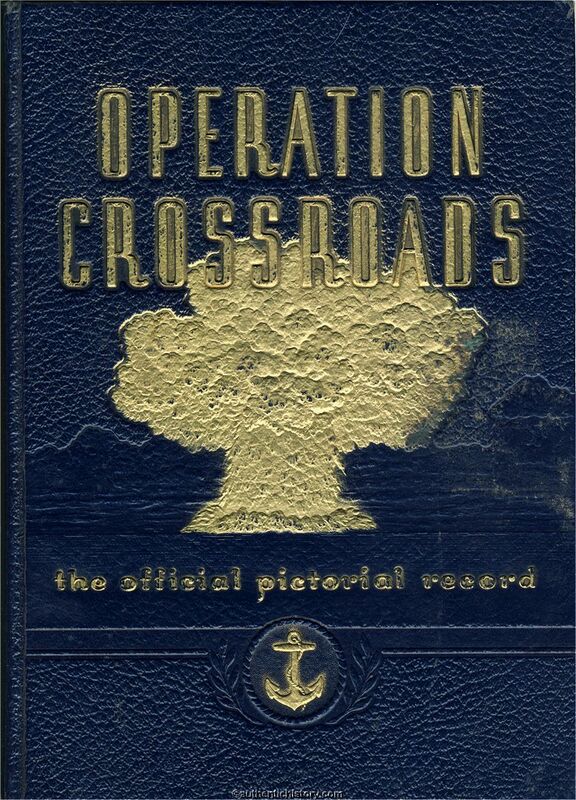 Operation Crossroads took place on Bikini Atoll in the Pacific (the natives were removed), and was to be a series of 3 nuclear tests. The press was invited, and the operation was covered extensively in the media. The "Able" test bomb was detonated at an altitude of 520 feet. This was the world's 4th atomic explosion and the first since WWII. 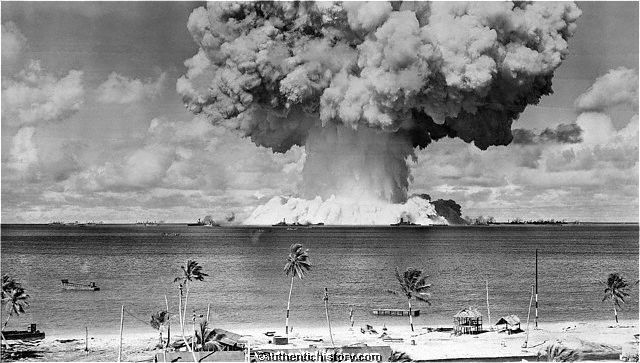 July 25, 1946: Bikini Atoll: The underwater "Baker" test of "Operation Crossroads" was conducted. "Baker" was designed to test the effectiveness of an underwater nuclear explosion on war ships. To that effect, nearly a hundred decommissioned WWII ships were moored in the lagoon. The bomb was detonated underwater at a depth of 90 feet. A third test was cancelled, largely because of contamination issues. October 28, 1946: David E. Lilienthal, (nominated for Chairman of the U.S. Atomic Energy Commission) spoke on Atomic Energy. November 6, 1946: Robert Oppenheimer, Director of Los Alamos, spoke on Atomic Energy, Problems to Civilization at UC Berkeley. December 1946: Greece and Turkey: The U.S. began to formulate an aid plan to help Greece and Turkey. The Russians were demanding military bases in the Turkish Straits, and British assistance to Turkey was about to end. 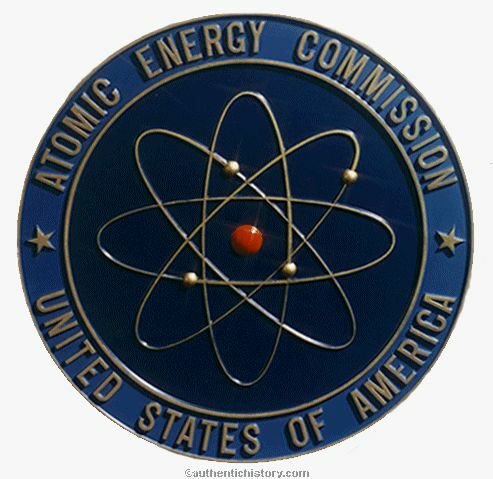 January 1, 1947: U.S. Atomic Energy Commission: President Truman created the Atomic Energy Commission and appointed David E. Lilienthal its chairman. Robert Oppenheimer was appointed Chairman of its General Advisory Committee (GAC). The purpose of the commission was to foster and control the peace time development of atomic science and technology. Creation of the commission followed intense debate, and reflected America's Cold War optimism during a time of nuclear monopoly. The rationale of the commission was that atomic energy should be employed not only in the form of nuclear weapons for the nation's defense, but also to promote world peace, improve the public welfare, and strengthen free competition in private enterprise. "the policy of the United States to support free peoples who are resisting attempted subjugation by armed minorities or by outside pressures." The Truman Doctrine marked the point at which America's foreign policy toward the Soviet Union shifted from one of friendship, to one of containment. May 3, 1947: Collier's magazine published their "Man and the Atom" issue, in which the editors set out to explore the positive side of atomic energy. Articles were published by David E. Lilienthal and Lester Velie. European economies strong and thereby resistant to communism. Joseph Stalin saw the Marshall plan as a direct threat to his plans for a weakened Europe and Germany under Soviet control, and he forbade any Eastern European countries from participating in the program. Historians largely view the Marshall Plan as a success. The years 1948 to 1952 saw the fastest period of growth in European history. More importantly, the plan made communism less appealing and fostered a reorganization of Western European politics largely along democratic lines. 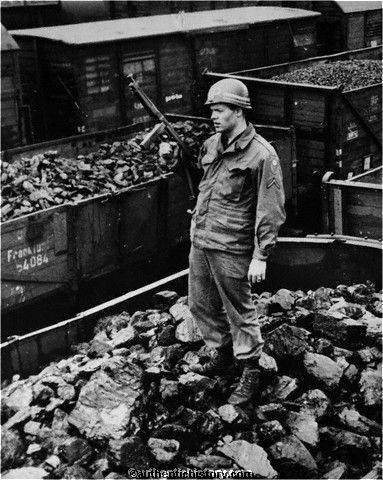 The plan likely helped prevent a major post-war recession in the U.S. by providing a broader market for American goods. 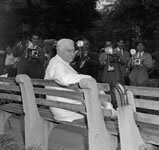 September 2, 1947: Latin America: The Rio Pact was signed by many countries in the Americas, including the United States. The central principle contained in its articles was that an attack against one was to be considered an attack against them all. September 11, 1947: Iran: The U.S. used diplomatic pressure as a screen for the newly elected Iranian government to not ratify a pro-Soviet oil treaty that had been drawn up under Soviet occupation the previous year. On October 22 the Iranian government overwhelmingly rejected the treaty and maintained sovereign control of their own resources. February 25, 1948: Czechoslovakia: The communists took over Czechoslovakia in a brutal coup. This event guaranteed four decades of communist rule in the country, and it so shocked the world that much of the U.S. congressional opposition to the Marshall Plan disappeared. 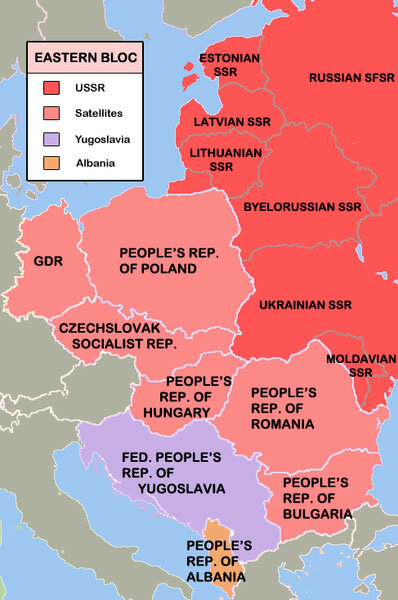 March 17, 1948: The Brussels Pact was organized to protect Europe from Communism. April 3, 1948: President Truman signed the Marshall Plan into law. 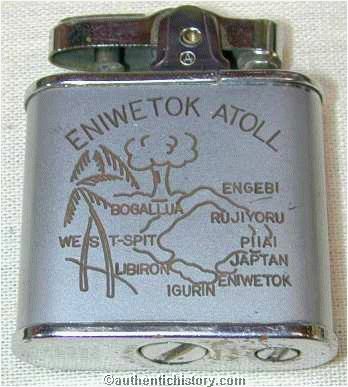 April 14, 1948: The first of many atomic tests are conducted at Eniwetok Atoll in the Pacific. 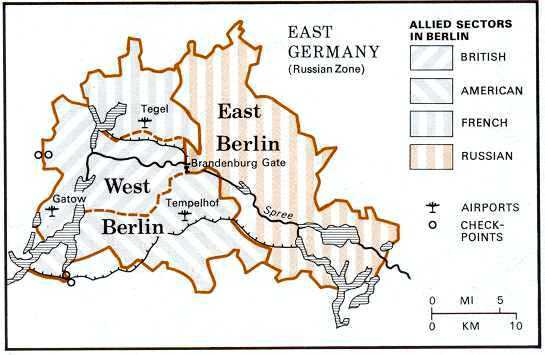 reductions had given the Soviets a vastly superior numerical advantage in Germany, and so a massive aerial supply of West Berlin was initiated by the United States and Western Europe. 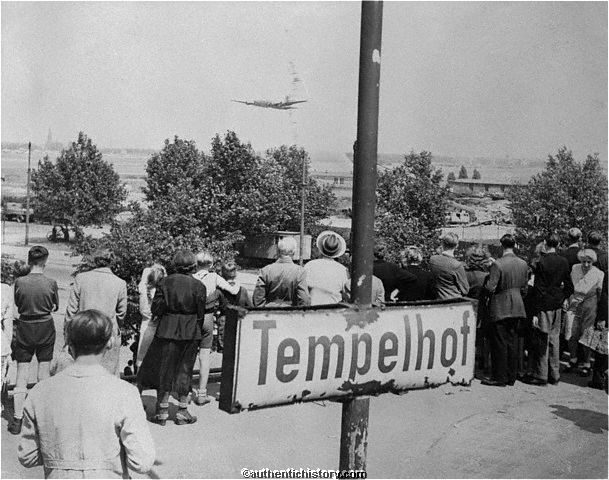 June 26, 1948: The Berlin Airlift: On June 26, the first two cargo planes loaded with 80 tons of supplies took off for West Berlin. 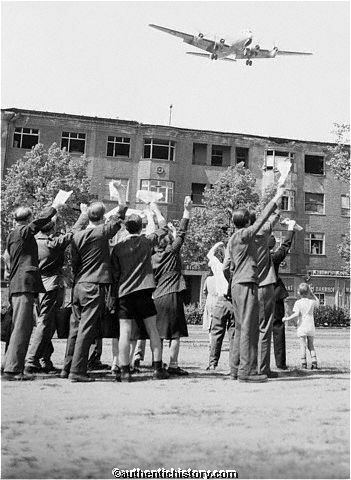 The Berlin Airlift (Operation Vittles) was expected to last three weeks. 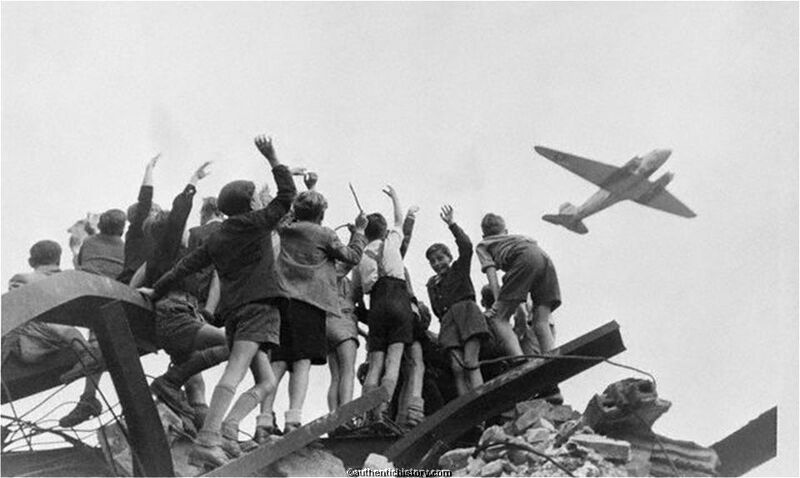 Great Britain's Royal Air Force and the recently formed United States Air Force, flew over 200,000 flights in one year, providing 13,000 tons of daily necessities such as fuel and food to the people of West Berlin. 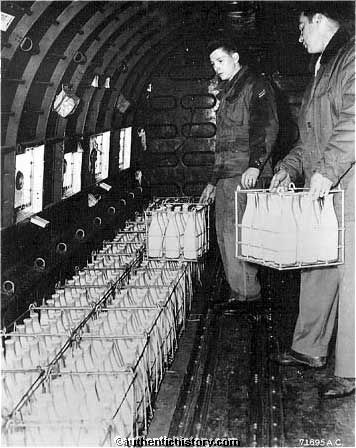 By the spring of 1949, the effort was clearly succeeding, and by April, the airlift was delivering more cargo than had previously flowed into the city by rail. 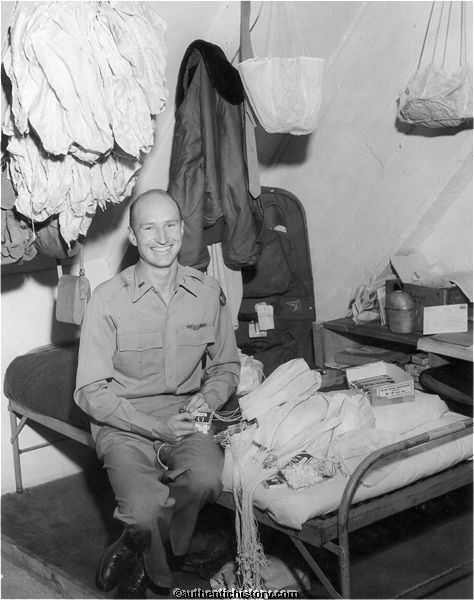 July 17, 1948: Operation Little Vittles: On a trip to Berlin, pilot Gary Halvorson gave away his last two sticks of Wrigley's Spearmint gum to children who had gathered near the runway. He told them he'd return with more, as long as they divided up the two sticks amicably. When the children asked how they would know which plane was his, he told them, "I'll wiggle my wings." The next day he dropped chocolate bars attached to small parachutes. Thereafter, the number of children waiting below grew, and he started receiving mail from the children, addressed to "Uncle Wiggly Wings", "The Chocolate Uncle" and "The Chocolate Flier". Halvorsen's commanding officer wasn't pleased, but General Tunner, commander of the entire operation, approved. 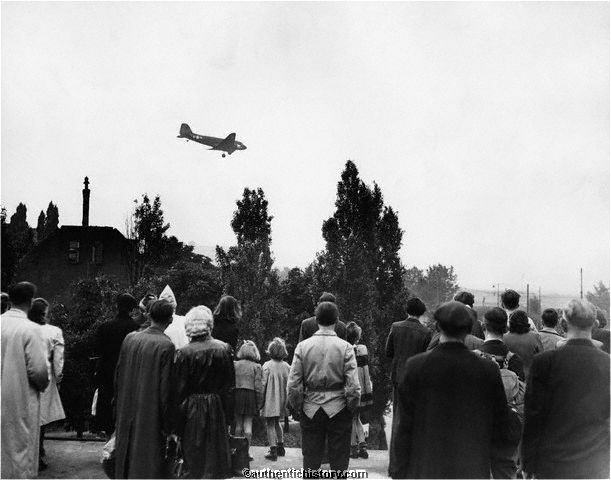 Soon other pilots were joining in, children from the U.S. were sending in their own candy, as did candy manufacturers. "Operation Little Vittles," as it came to be called, was a propaganda success. July 20, 1948: President Truman issued the second peacetime military draft in U.S. history. November 3, 1948: Harry S. Truman won the presidential election over Republican Thomas E. Dewey. 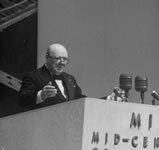 March 31, 1949: Winston Churchill spoke at the Massachusetts Institute of Technology, Cambridge, Massachusetts. He described the atom bomb as a deterrent to Soviet aggression in Europe. April 4, 1949: NATO (the North Atlantic Treaty Organization) was ratified. The treaty, intended as a safeguard against the threat of Soviet aggression, provided for a collective self-defense and was designed to encourage greater political and economic cooperation in the Atlantic region. The original Western democracies that joined were the United States, Great Britain, France, Belgium, the Netherlands, Denmark, Italy, Luxembourg, Norway, Iceland, Canada, and Portugal. October 24, 1949: The cornerstone was laid for the new United Nations headquarters on the East side of Manhattan, New York. President Truman delivered a short address. 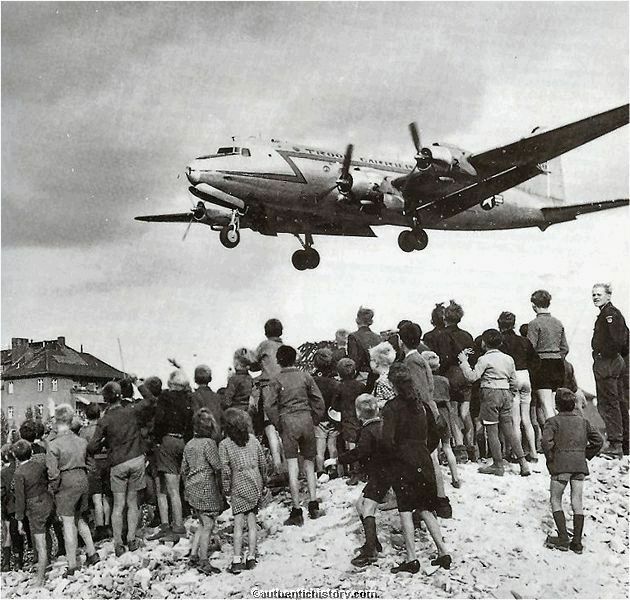 May 12, 1949: The Soviet Union, somewhat humiliated by the success of the Berlin airlift, finally ended the Berlin Blockade. 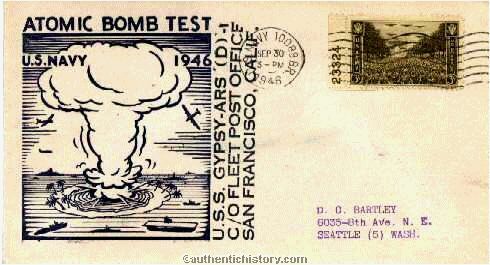 August 29, 1949: The Soviet Union successfully tested its first atomic bomb, and the U.S. monopoly was over. October 1, 1949: China: Communist Mao Zedong took control of China and established the People's Republic of China. December 1, 1949: China: Chiang Kai-shek moved to Taiwan and created the Nationalist government. 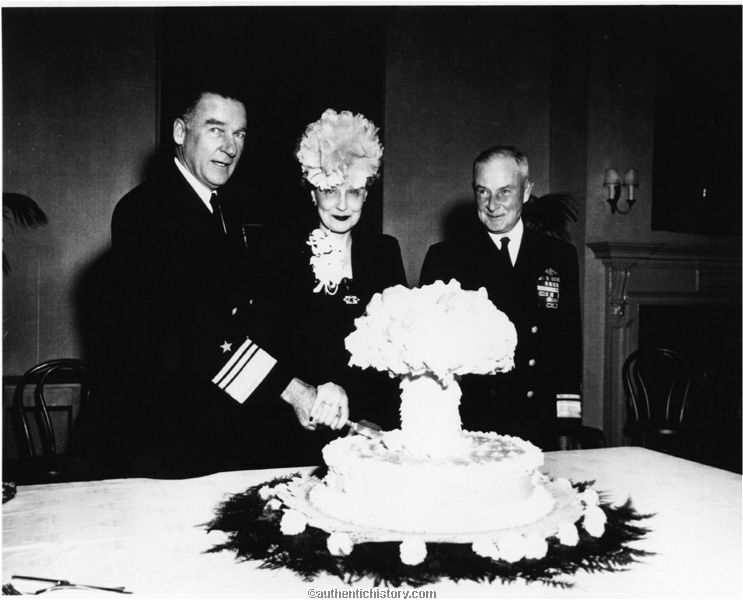 January 31, 1950: President Truman approved the development of the hydrogen bomb. June 24, 1950: The Korean War Began:. Russia supported North Korea, which invaded South Korea equipped with Soviet weapons .